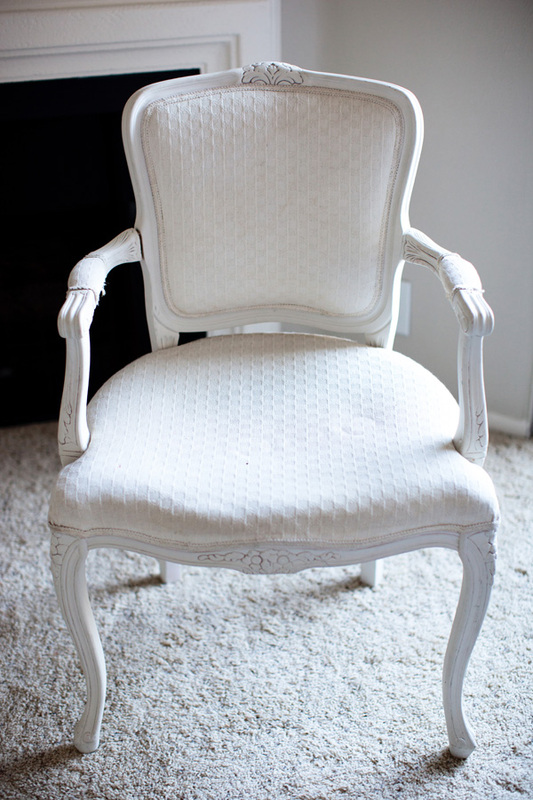 DIY: Reupholstered Craigslist Chair using CURTAINS! Ok, I’m pretty into the whole Hollywood Regency style of decor but it’s not always my idea of fun to spend $800 on an arm chair. I picked up this chair from some chick on Craigslist a few months ago. The seat was sunken in, the fabric was kind of raunchy and stained with mysterious substances, it had a bad paint job, and one of the arms was loose, but it didn’t have bedbugs and at $20 seemed like a steal. I mean right? 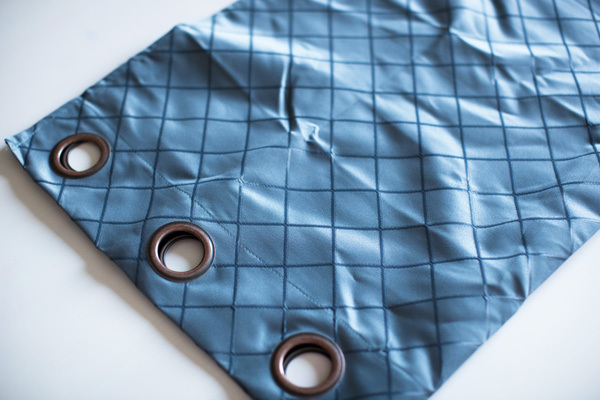 When I was finally ready to do this project (when I stopped being lazy) I couldn’t seem to find a fabric I was ready to commit to, especially at up to $40/yd for upholstery fabrics. During a random stop at the nightmare Ross on 3rd, my husband pointed out a curtain panel that would be a good option for the mean time. Then we were like “welll….techincally it’s fabric”. So, for $6 I had more than enough fabric for the chair. Here’s how I did it. Remove all of the old stuff. Ugh, worst part. Pay close attention to how the old fabric was attached while you’re removing it. You will need to reattach it in the same way. 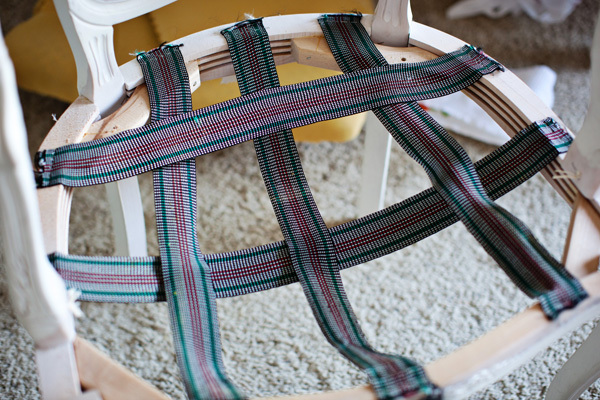 Once the chair is stripped bare (oooh, lala), use the old fabric pieces as a template. I used chalk to outline each piece and then cut them out. If you’re working with a design or pattern it’s a good idea to try to match up it up so the seat and back match each other. It’s probably a good idea to iron or steam out any wrinkles first, which I didn’t demonstrate here because I’m the worst. To fix the sunken in seat all I had to do was tighten the loose, saggy upholstering webbing and secure with 2 rows of staples. Cut it, pull it, staple it. Now it was time to get to the fun stuff. I painted the wood frame with primer and a satin white paint. Then I finished it with a coat of clear acrylic for a high gloss finish. I used Safecoat Naturals paint, primer and Safecoat’s Acrylaq sealer for this project. You can use whatever. I was testing eco-friendly paints. This one is pretty good. The foam was still in relatively good shape so I just covered it with a layer of new batting. I attached my new fabric using my trusty electric staple gun. The size of staple depends on how thick your fabric is. 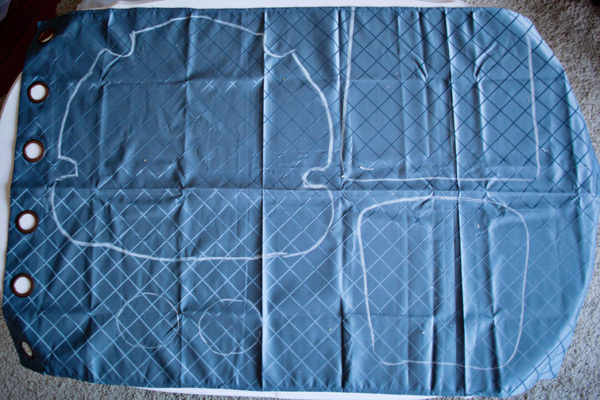 It’s a good idea to start each section with 2 anchor staples (top/bottom, back/front, etc) and then work your way around pulling the fabric taut as you go. I should have taken more photos during this process but oops! Next time, promise. 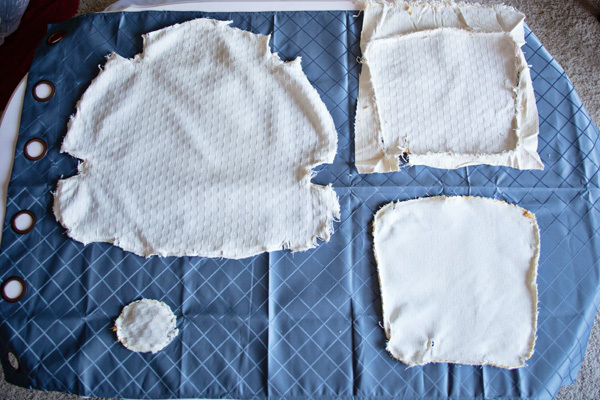 At this point you should trim any excess fabric away from the edges using a blade or small scissors. Now it’s time for the trim. The finishing touch! The icing on the cake! The….sorry. The most popular choices are cording, gimp braids (har har har), or nail heads. 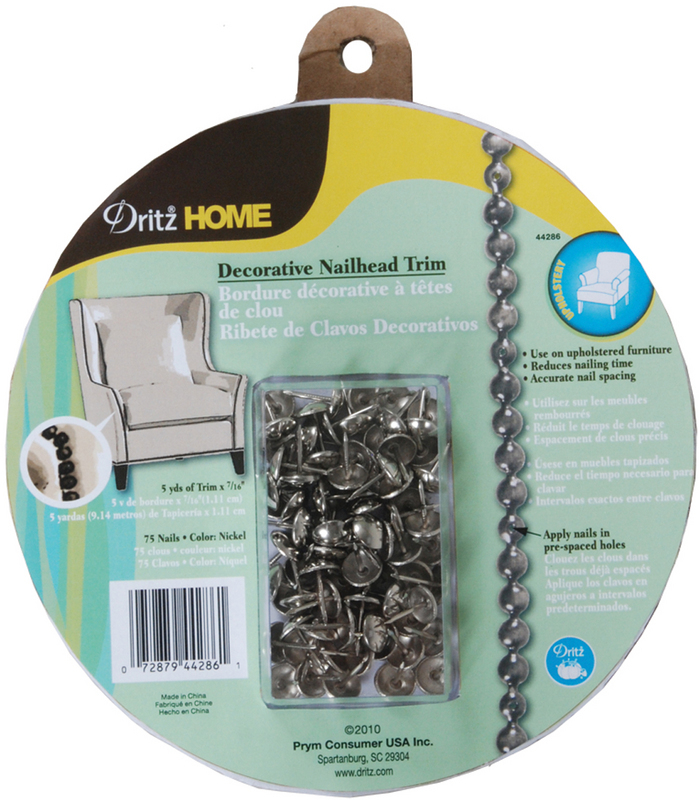 The obvious choice for me was nailhead trim in a nickle finish…it’s like jewelry! 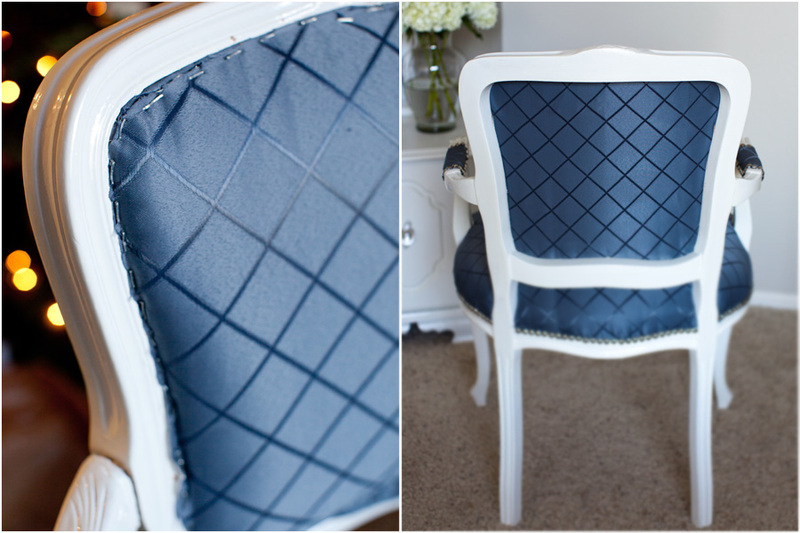 These nailhead strips are amazing and super easy to attach. I got it for $10 at Joann’s thanks to a 50% off coupon. If you’re paying attention, so far I’ve spent less than $20 on new materials. Apply the trim so it’s covering all of your staples. Using a rubber tip on your hammer prevents scratching the nail heads and damaging the wood. Do any touch ups and repairs as needed. I fixed the arm by hammering it back in and using caulking to cover the separated joint. All done! 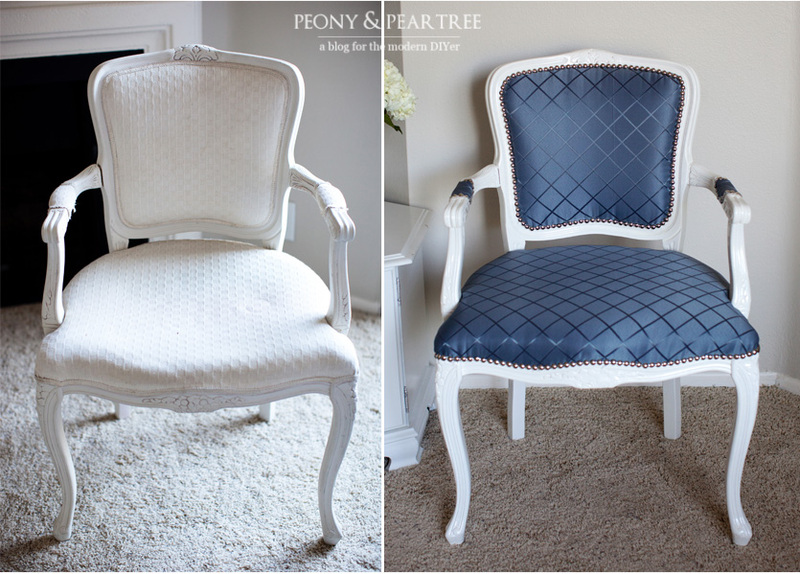 $20 chair transformed with less than $20 of new materials, of course assuming you already have paint. In LA this would cost like $4,000 and part of your soul. It looks beautiful! Clever idea to use the curtain panel! Nice job on the chair, it’s gorgeous! I do like the royal blue as well – beautiful! 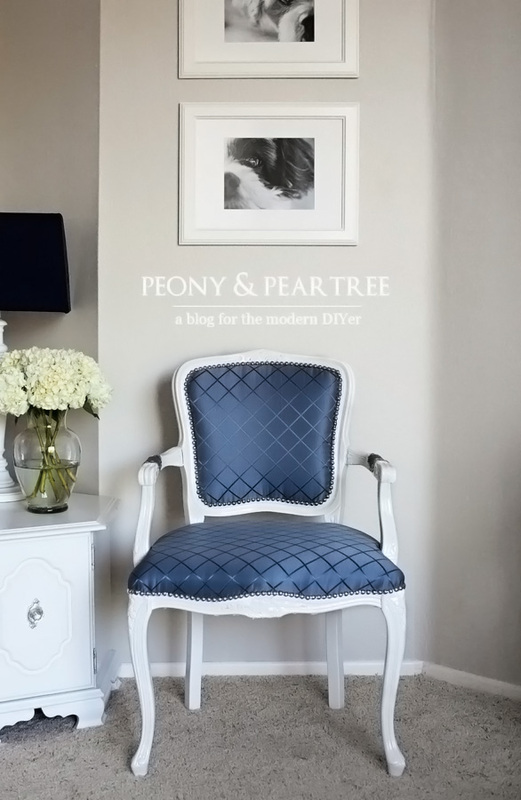 I’ve got this linked to my chairs post too today, well done! I’m inspired! I have two chairs given to me by my mother-in-law that I’m excited to re-do. Now that I’ve seen your tutorial, I can’t wait! Hi Holly! I used a flathead screwdriver to remove all of the old staples and was able to easily remove the fabric that way. You want to remove the old staples so you have room to place the new ones and your trim. Hope that helps! Wow. I am very impressed with you right now. You made that look so easy, when I am quite sure it wasn’t. Lovely job. via Constantinople by Sir Robert Sutton, all thoroughbred. Great post! 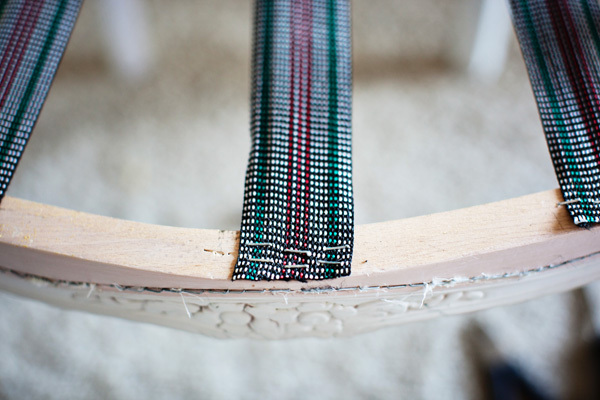 I’m going to try this myself with an old chair we have.